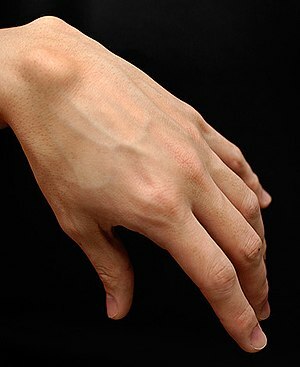 Ganglion cysts are the most common tumor (mass) of the hand and wrist. The cysts do not have the ability to spread to other parts of the body—like cancer. However, these cysts may enlarge with activity. Many of the cysts will also decrease in size with rest. Ganglion cysts do not typically go away, but many are not symptomatic and therefore require no treatment. These cysts, although they feel hard, are not solid—but contain fluid. Many cysts do not require treatment and treatment is reserved for those cysts causing pain. 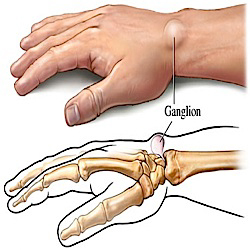 Ganglion cysts are most common: 1) top of the wrist 2) bottom of the wrist 3) distal aspect of the top of the finger. Regardless of the position, the cyst typically articulates with a joint below as the source of its fluid. 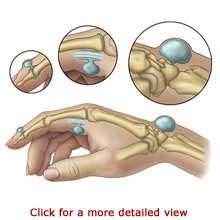 A ganglion cyst of the top of the wrist (the most typical location) with a drawing showing the origin of the cyst from the underlying wrist joint (carpus). Because the cyst is filled with synovial fluid, many times the cyst will enlarge with activity of the joint. When the joint is rested, often some of the fluid is resorbed-making the cyst appear smaller or at times imperceptible. However, the cyst never completely abates without surgical management. Most patients present to the hand surgeon with a complaint of a mass. In some cases the mass is associated with pain. In other cases the mass may be cosmetically troubling. After your hand surgeon has reviewed your symptoms, an examination of the extremity is begun. The range of motion of the joints is recorded and a neurological exam completed. 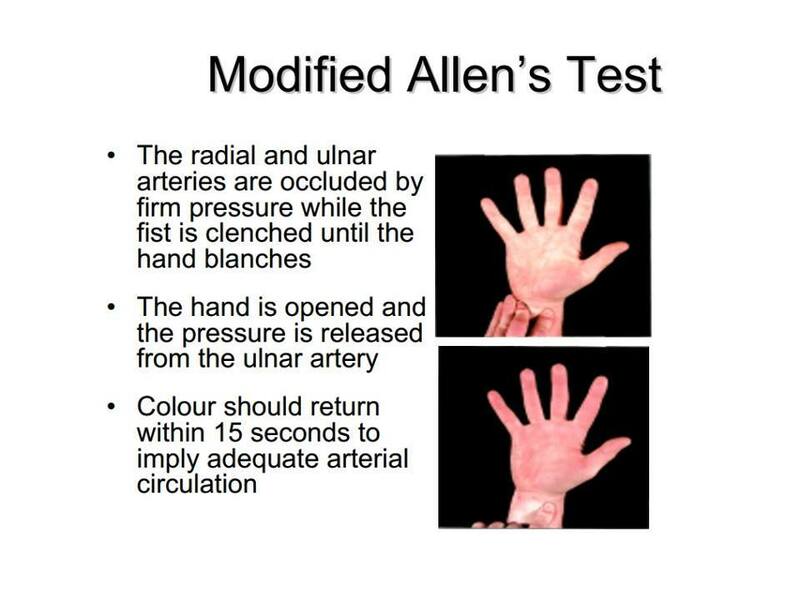 The vascular status of the hand may be documented utilizing an Allen’s test—particularly if the mass is on the bottom (volar) part of the wrist. The surgeon may also utilize a light to determine if the mass transmits light—transiluminates. This test determines the mass is not solid. Imaging is typically not required to diagnose ganglions, although it may help determine other underlying conditions. X-rays can determine underlying arthritis of joints or old fractures which may play a role in treatment. Ultrasound examination or MRI can confirm the cystic nature of the ganglion and elucidate further its size and its relation to the underlying joints. If the cyst does not cause pain or interfere with function—observation is typically warranted. Since the masses are not cancerous, routine follow up is not necessary. However, if symptoms change new evaluation may be necessary. Most symptomatic ganglion cysts of the wrist and hand can be treated on an outpatient basis. These can be treated with local or regional anesthesia in most cases. An incision is required for treatment—and certainly there is a guarantee to trade a mass for an incision. However, properly planned the incision should heal well with good cosmetics. Blood loss from the procedure should be minimal and standard surgical risks are applicable. A soft dressing is applied after surgery and many times this dressing can be changed at home within the first 3-5 days after surgery. Early work on range of motion of the wrist or digit decreases the chances for stiffness. Recurrence rates after surgical excision are typically in the 5% range. Usually therapy is not required after surgical incision. Time out of work and return to sport is determined by the location, patient, and cyst involvement.